Throw amazing cocktail parties while exhibiting professional dexterity, uplift the charm of your bar counter, and ensure easy post-party cleanups - ideal for professional bar counters as well as home bartending needs. ORDER NOW & Get this Incredible Bartender Kit with Boston Shaker Delivered to you in Just 3-5 Days! IMPRESSIVE & FUNCTIONAL - Prepare professional quality cocktails or flaunt your mixology skills - be it making kickass Martinis or classic Mojitos. Our 10 pc Boston Bartender Kit takes the bar to all new heights & helps you host incredible parties - your search for the best bartender kit ends here. PERFECT SET - Shake & mix effortlessly with 2 pc Boston Cocktail Shaker Kit, strain conveniently with a Hawthorne Strainer, extract the flavours of fruits or herbs using a muddler, stir using a 10,43-inch bar spoon, measure precisely using a jigger, and pour smoothly using 4 pourer spouts. 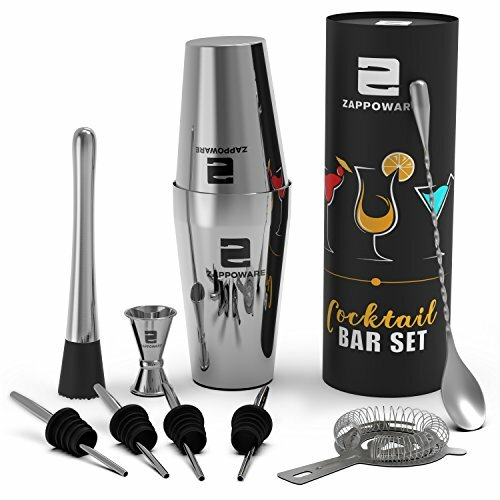 PREMIUM QUALITY - Made from superior quality stainless steel, our professional bartending kit looks classy & elegant, proves easy to clean (Dishwasher Safe), doesn't introduce any chemicals or toxics into your drinks, and is equally suitable as professional bartenders' or home bartender kit! IDEAL GIFT SET - Comes in a high-quality packaging, and makes for a perfect gift for any friends, family or colleagues! This bartender tool kit puts most essential bartending components to your disposal & makes it easy for anyone to become that specialist who often impresses you at a bar counter. GUARANTEE - With our 100% RISK-FREE SATISFACTION GUARANTEE on this Boston Shaker Set & other tools, you have got nothing to lose. However, we are quite sure that you will be super impressed with their durable build and the fact that they remain new like even after innumerable cocktails. If you have any questions about this product by ZAPPOWARE, contact us by completing and submitting the form below. If you are looking for a specif part number, please include it with your message.